Announced just before the New York Toy Fair last year, Nerf’s Rival blasters, which launched tiny foam balls at speeds of up to 70 miles per hour, were the biggest innovation in foam warfare seen in years. And this year Nerf is expanding the Rival line in the best way possible. Ahead of the the 2016 New York Toy Fairnext month, Hasbro gave Gizmodo an exclusive first-look at four of its upcoming Nerf blasters that will eventually be hitting store shelves in the Autumn, just in time to add to your Christmas wish list. They’re all massive, packed with ammo, and look like a guaranteed way to dominate your next office Nerf war. Designed to keep teenagers interested in the Nerf brand, the Rival blasters were easily one of the most exciting new toys released last year. But as soon as they hit store shelves, Nerf enthusiasts found ways to further improve the blasters, and one of the most popular DIY upgrades was converting the Zeus to be fully automatic. This hack obviously didn’t go unnoticed by the designers at Hasbro, because the new Nerf Rival Khaos MXVI-4000 is the first fully automatic blaster in the Nerf Rival line. Holding down the trigger quickly empties the blaster’s capacious 40-round magazine, but to power the $70/£49 Khaos MXVI-4000's auto-feed mechanism you’ll need to fill it with six D-sized batteries. So expect this blaster to have some real heft once it’s primed and ready to fire. How can you not be excited about a blaster named after a massive prehistoric creature? 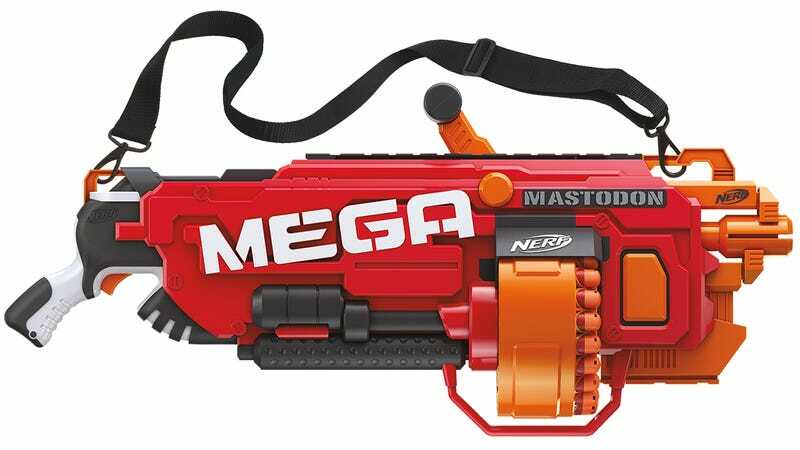 The Nerf Mega Mastodon is the first motorized blaster in the Mega line that fires super-sized foam darts as fast as you can pull the trigger. Its rotating drum holds 24 darts in total, and that shoulder strap is as functional as it is a fun accessory because like the new Rival Khaos, the $80/56 Mega Mastodon needs six D-sized batteries to bring it to life. So it’s going to get really heavy, really quickly, in the heat of battle, and you’ll be thankful that shoulder strap is there to help carry all that weight. Nerf’s Modulus line is all about letting blaster fans take the bigger is better approach. Using modular components they can assemble a massive custom blaster that will hopefully intimidate their opponents into submission before a battle even begins. And the upcoming Modulus Tri-Strike incorporates three types of Nerf ammo into a single blaster. The $50/£35 Tri-Strike includes 10 Elite darts, four over-sized Mega darts, and one foam missile that can be particularly satisfying when it hits your intended target. And it looks like Nerf has also improved the handle included on the original Modulus blaster to be more comfortable with the new Tri-Strike—for that reason alone it might be worth the upgrade. If your strategy during a Nerf battle is to just dive in and cause as much damage as possible as quickly as you can, you’ll definitely want to add the new $50/£35 N-Strike Elite Hyper-Fire Blaster to your arsenal. 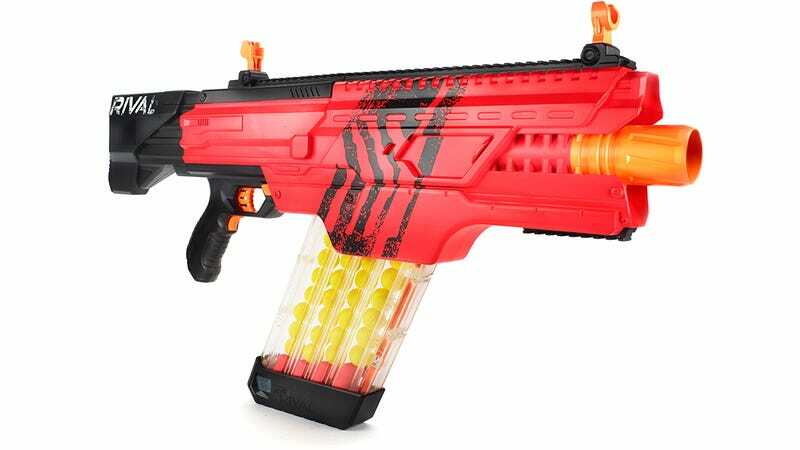 It’s being billed as the fastest-firing Nerf blaster to date, capable of unloading up to five darts per second on your opponents in its full automatic mode. To ensure you don’t accidentally squander all of your ammo at the start of a battle, the N-Strike Elite Hyper-Fire Blaster includes a 25-dart capacity drum. But you’ll still want to try to show some restraint, or you’ll find it empty in about five seconds if you’re not careful, leaving you nothing but a frustrated, easy target.